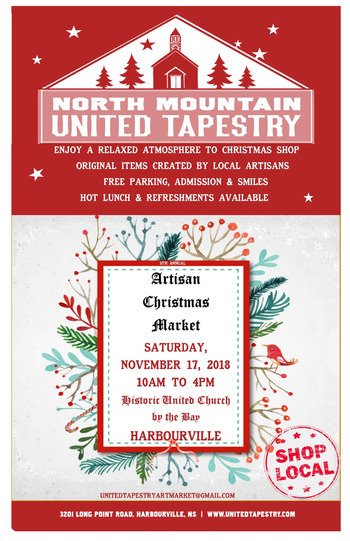 The 5th Annual North Mountain United Tapestry Artisan Christmas Market. We have one-of-a-kind unique, hand crafted gift items for that "special someone" or "you"! Support creative and skilled artisans from the North Mountain and surrounding area. There will be 20 vendors and you will find everything from jewellery, fibre arts, baked goods, quilts, clothing, fine arts, carving, leatherwork, mosaics, pottery and more. The talent in our area is outstanding. A hot lunch and refreshments will be available. After shopping the Artisan Market, head on over to the Harbourville Hall for their Tea and Bake Sale. Making a weekend trip to the Annapolis Valley? Harbourville is a small fishing village on the Bay of Fundy, home of the highest tides in the world. Located on the coastal side of the North Mountain, it is a photographer’s delight.